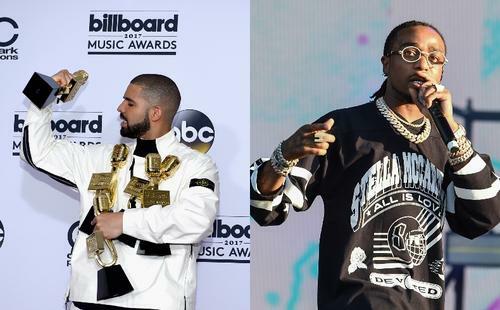 Drake & Quavo Hit The Court For The "National Bando Association Pree Season"
Rappers have occasionally shown to be proficient on the courts, and the “slippery” Quavo stands among the game’s most capable ballers. It wasn’t long ago that Huncho took to the courts for the celebrity All-Star game, proving his worth by taking home the game’s MVP honor. In short, the man has athletic tendencies, no doubt finding himself at ease with net to score on. As for Drake, well, his abilities have yet to be truly tested. If Instagram clips are to believed, the man’s capable enough, though only the most ardent Jimmy supporters will place him alongside hip-hop’s most formidable. In any case, what Drake may or may not lack in finesse is made up for in sheer leadership qualities; who wouldn’t want to take to the courts with Champagne calling the play, even though his insistence on speaking exclusively in Toronto-flavoured-patois has led to a few bungled executions. Today, the Scorpion rapper has taken to Instagram to celebrate the inaugural launch of the “National Bando Association,” where he and Quavo linked up for the first “Pree Season” game. Check out the picture, and sound off below. Clearly, the Aubrey and the Three Amigos tour has already led to some timeless moments of male bonding.